We're back from our summer vacation! We spent about two weeks just traveling and having fun, which was a fun wrap up to summer. We're not quite back to school yet, but the kids have band camp and the boy has soccer starting back up, so we'll be busier again. I still have a few older lunches saved to share, before the new rounds of lunch packing starts. This lunch features a new box I just had to have. Tupperware has a whole Wonder Woman themed line and the sandwich box was a must have. It divides perfectly with some square silicone cups for four small compartments, which is perfect for my not-big-eater child. In this lunch, she took a roll up deli sandwich leftover from a deli tray I purchased for something or other. My roll ups never look this pretty and this one was stuffed with ham, cheese, lettuce and roasted red pepper. She's not really wrong just taking one, they're filling! 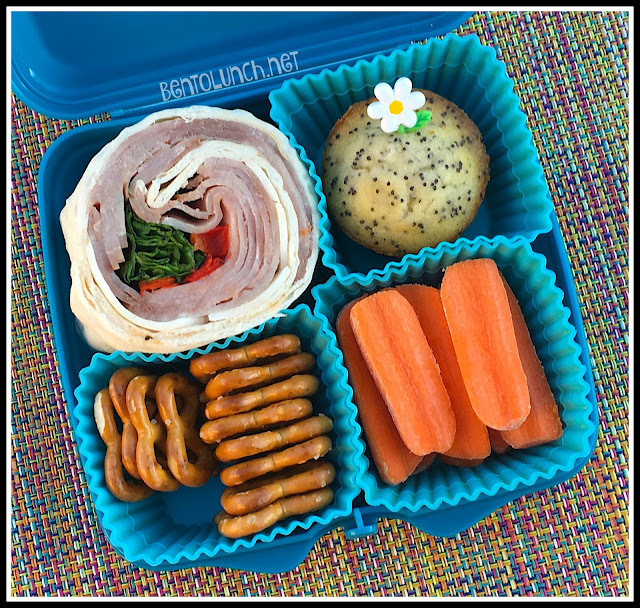 For the other compartments, she chose baby carrots, which I sliced in half (in retrospect, this was a pre-braces lunch), some pretzels, and an almond poppyseed muffin. There is a small chance she took yogurt or applesauce with this, but more than likely this was all she ate. Lunch, of course, is in that awesome new Wonder Woman box. There's also two small side cups that went with it, and a tumbler that is all mine!